Irrigation – Turf and Landscape Inc.
Keep your lawn green with a professionally installed irrigation system. A healthy, green lawn. Hassle-free watering. Satisfaction every time you step onto your grass. That’s how you’ll know you have an irrigation system installed by Turf & Landscape Inc. We make sure your watering system is installed right the first time, even conducting pressure and flow tests to ensure proper coverage before installation. That kind of close attention to detail means you’ll spend more time relaxing and less time dragging hoses and sprinklers around during the hottest days of the year. Whether you’re looking for a convenient automatic sprinkler system or just a more efficient way to water your garden, our experienced team can design, build, maintain, and winterize your system, delivering the right solution at the right price. 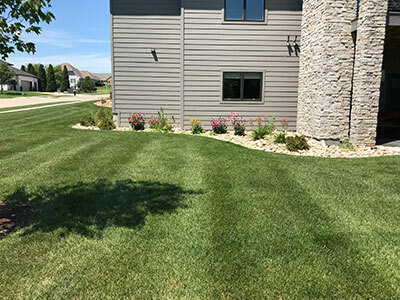 Your lawn will thank you when you choose Turf & Landscape Inc. for all of your irrigation needs.